RVP Charters is your premier charter bus and minibus rental company in Washington DC. Whether you're here for a wedding, corporate trip, sporting event, school event, or other private affair, we'll provide you with smooth, personalized transportation throughout your entire trip. RVP Tours is the leading charter bus services company in Washington DC. Whether you visit the city for wedding, sports, corporate event, college or school event. It can also be a private family trip. Our company provides best personalized services for the complete journey. If you are visiting this city with a large group then RVP Tours are the best company to handle all the large scale transportation. There is so much to do and see when you are visiting the capital city! National monuments, fine dining, shopping, and world class museums are some items that will be there in your “to-do list”. RVP Tours provides consistent transportation services in and around DC. We will always have you covered properly. We are skilled at finding the right bus for your size of the group. We also are the best service providers for intercity travelling. You will find charter buses for a group of 18 passengers to 56 passengers too. There are a lot of amenities that you can select while booking a charter bus service from our company like, WiFi, restrooms, fully reclining seats, television etc. If you are unsure about how to book a charter bus for your trip, then you can chat online or call the reservation specialists. Washington, DC is a captivating city. It has a lot to offer the tourists. This city is rich in history and has lots of cultural and magical attractions on offer. You will indeed be busy throughout the day during your visit. There are numerous monuments and museums to explore in this city. Our company has partnered with many schools, colleges, sports teams and large business houses to provide them bus chartered for the trips and events outside the city. Irrespective of your work, the company strives to provide the best transportation services to your group during the visit so that you can enjoy to the fullest. If you are one of those people who make arrangements at the last minute, then we will still be at your service. 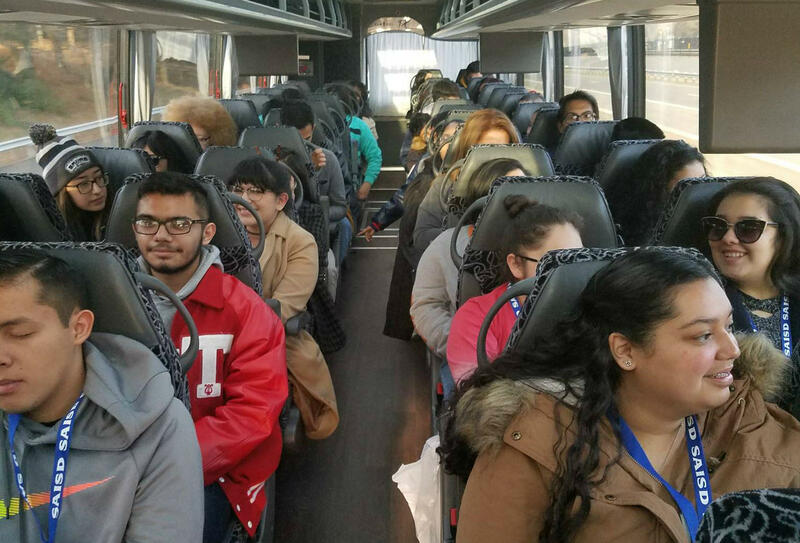 If you are visiting DC for a seminar, convention, trade show or any business meeting, then you do not have to look any further as we provide the best bus service for the corporate events as well. Since we have an experience in providing business trips all around the city we do recognize the need to stay on schedule all the time. The driver provided by us will follow your itinerary perfectly. You only need to tell us the destination and the time of your pick up. The rest will be taken care of by the driver. The driver will always ensure for your safety, comfort-ability during the trip. You can simply relax and focus on the work. When you book a charter bus you are saved from separating your group into different cars. You save yourself from reimbursement of gas money to the employees. Neither do you have to worry about getting people stranded. Your team will be able to unwind and relax together during the trip. You can also work on some last minute ideas for the upcoming event if you stay together. You will receive free WiFi service on the bus. There will also be power outlets on board if you want to plug-in a device and use it. You can always make corrections to your presentation, reply to email, watch the video presentations etc. on board the charter buses. If you are flying into the city, then allow us to be the personal airport transfer for your whole party. The public transport in any city is unpredictable and you do not want to separate your team into smaller groups in an unknown city. RVP Tours will be happy to do the airport transfers for your company. You will be dropped at the hotel from airport, taken from the hotel to the convention center etc. 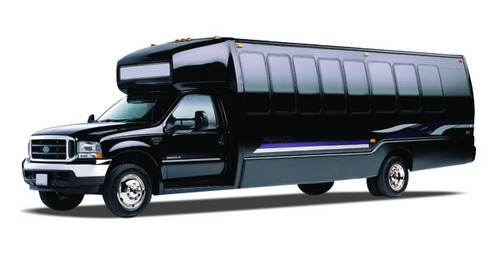 If you want, you can also make a shuttle service between the hotel and convention center. This will allow your employees to leave at leisure, and always arrive the venue on time. If you are arranging a wedding in this city, then transportation will really be the last thing that you would want to worry about! You definitely would not want to worry about the airport transfers, arrival, departures at the wedding venue of your guests and other members. We at RVP Tours will very well handle all the logistics so that you can rest and relax on your wedding day. If you have a charter bus service for your guests the driver will have them reach at the hotel, bachelor party, pre-wedding dinner etc., right on time. If you keep a shuttle service from the wedding venue to your hotel then it will be easy on your pocket and you will also be able to watch upon your guests. A minibus for this event is perfect. None of your guests will ever get lost in a big city like DC with a proper shuttle service. Your guests will always arrive on time for the wedding with this service. You, your family and friends will all be able to travel together for the ceremony. If you are a visitor then you must make a proper attractions list that you need to see in this city. National mall- it is a unique park that allows you to see the Lincoln Memorial, Reflecting Pool and Washington Monument. Just around the same road you will find National Air and Space Museum, Smithsonian National Museum of Natural History etc. American Art Museum, International Spy Museum is towards the East and are a must visit too. Around the West End is the famous White House. You need to visit it and admire the beauty! There are many food festivals in and around the city that you must explore. You can visit Kennedy Center Rooftop Terrace to catch a perfect glimpse of the city’s skyline. You can also take day trips to Philadelphia, New York City, Brooklyn, Baltimore, etc. If you love game days then those are always better when experienced with a charter bus. Bus is the best way to travel when you are cheering for your favorite team. 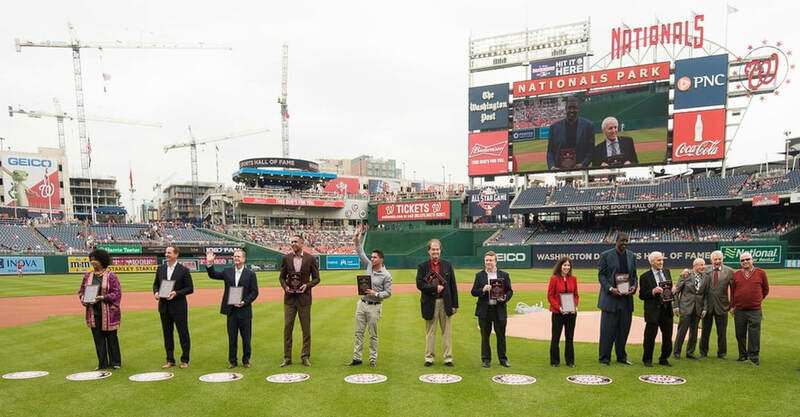 Whether you need to visit a local university or school ground, FedEx Field, and Nationals Park, charter bus is the way to go. You can now keep the tailgating equipments in the storage area of the bus. It will remain there safely throughout the journey. There is on-bus entertainment complete with WiFi, Television and music system for your relaxation and entertainment. The bus will stay with you throughout the entire game day and then take you all back home safely. If your team won the game, you can all definitely celebrate in together. We cater to all teams like school, college and even professional teams. If you have a large professional team then a big fleet is what you really need. However, you can also select a coach for service because it provides proper storage room for equipment, luggage and carry-on. There are recliner seats and plenty of leg room for each player. These charter services ensure that the players can rest before their big game. School field trips, church trip, family reunions, etc., can all be very easy to plan up with a charter bus service. You will always find the perfect size bus for your group size and according to your needs. 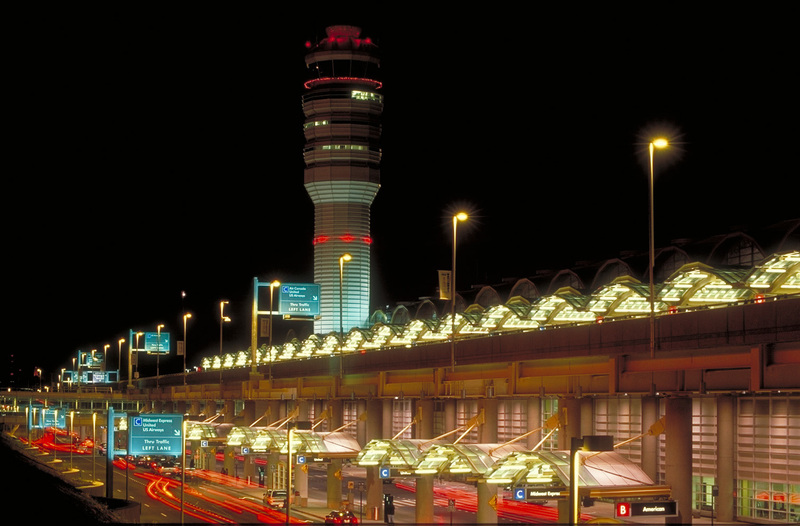 A visit to DC will leave you with everlasting memories about this place. World famous museums, monuments and numerous historical documents are a must visit. 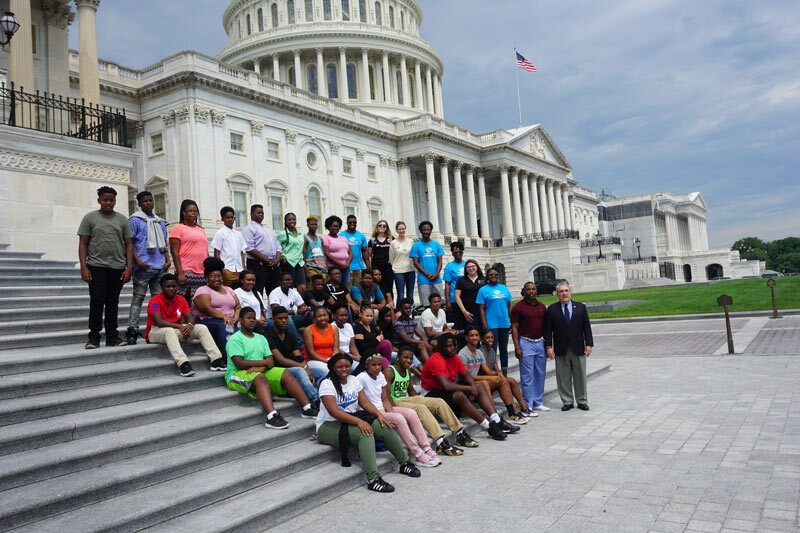 Washington is a perfect field trip for school kids of all ages. You do not need to travel with school kids in a worn-out and uncomfortable school buses. Charter buses are perfect for your group with recliner seats, AC, television and other entertainment possibilities. If you are hosting a family reunion at Washington then you would want properly organized transport during your stay. RVP Tours is your best choice because here you travel as one large group instead of breaking up into smaller groups. You would not have to rely on public transport at all. The driver will follow your itinerary and no one will get lost. Washington DC has some of the most gorgeous universities that are worth your time. If you are in city, then you must plan and visit local universities like George Washington University and Georgetown University. If you do not want to walk around the enormous campus, then you can also charter a bus for your group. The bus will take you around the university and leave you at the important spots. It will also travel, according to the time mentioned. There are many factors that determine the cost of the rental of charter buses, like seating capacity, wagon chosen, on board entertainment chosen, the total distance that needs to be travelled etc. In the end, RVP Tours are safe and expert choice for any type of group travel to this city. They provide instant service.